Your ability to recruit and retain talent is going to determine how successful your business will be. And in today’s job market, which consists primarily of passive job seekers, meaning people who are already employed but who would be willing to hear an offer or interview for something else, the need to focus on talent acquisitions is as great as ever. But there’s a lot that goes into an effective recruiting strategy. To get the right people applying for your positions, you need to spend time creating exciting roles, designing competitive compensation packages, crafting an employer brand and enhancing your candidate experience. There’s so much to do that you may want to consider outsourcing some other HR functions to help manage your current staff’s workload. Nowadays, one of the things that most concerns job seekers is how well a position will fit into their lives In other words, what kind of work-life balance can it provide? It used to not be this way; people found ways to adjust their lives to the job. But as more and more people are interested in maximizing wellness, there has been a shift in the way we understand the role of work in our lives. Setting up a flexible work environment demonstrates a commitment to this concept. Allowing people the chance to work when they want, or from wherever they want, and not putting too many limitations on how they do their jobs will allow them to spend quality time doing the other things they like to do. And when this happens, people are happier and more productive. It’s hard to get to this point, and you’ll need some dedicated employees to make it work. But that’s kind of the point. By creating a flexible workplace, you’re going to attract people who are capable of thriving in these types of environments, contributing even more to the culture of working hard in a flexible manner. Bosses and managers are a fact of life. But the reality is that if you give people more autonomy, they will be more productive. Trusting people to do a good job makes them more motivated to do so, whereas micromanaging can lead to resentment and frustration, neither of which will improve the quality of work. Top talent is going to want to feel like they have room to spread their wings and make their mark on the company. A flexible work environment that emphasizes individual autonomy will help attract these top performers to your team, and it will give them a place where they can thrive, increasing your chances of retaining them long-term. Flexible work environments are more conducive to collaboration. Not only do people tend to feel freer and more relaxed, making them more open to working with others to innovate, but the physical openness of a flexible office also encourages collaboration. Most flexible workplaces have open floor layouts, and they don’t use cubicles, closed offices, or other design elements that block movement and communication. This creates a scenario where asking someone for help is a simple matter of turning around in your chair, making it much more likely people will team up and work together. And when your best and brightest work together, good things happen. Designing a flexible office also gives your company some curb appeal. When people come in for an interview, they will be excited to see something new and refreshing, which produces a positive first impression. Later on, when a candidate is deciding between one position or another, the way they felt in the office could end up pushing them towards deciding to take your offer. One nice feature of a flexible work environment is that it allows you to bring in a wider range of people. For example, you may be able to work with people from another part of the world, or you might just simply have the chance to interact with someone who couldn’t work in another environment, e.g. a busy parent. This diversity helps to stimulate collaboration, but it also will make your company a more exciting place to work. Few people want to be surrounded by a group of people with too-similar profiles and backgrounds. It’s much more exciting to work with like-minded people who are different from you, as it makes the workplace more stimulating and dynamic, helping to improve engagement and productivity. This can be a major selling point when meeting with top talent. And it’s also a way to keep them stimulated and engaged once you’ve managed to secure them on your team. While redesigning your workplace to be more flexible can have tremendous impacts on your business, particularly in talent acquisition and management, it’s important to remember this is a process. Introduce changes to the way things are done in small increments, and allow room to adapt to the specific needs of your workplace. But get ready, for this transition is going to redefine your business and the lives of those working for it. About the Author: As The Founder of Digital Exits, Jock Purtle fully understands the importance of having the right talent on board for success. He works with other business owners to plot their growth strategy from the initial funding stage all the way to the exit. He contributes frequently to discussions about business administration and management, with a particular focus on HR. 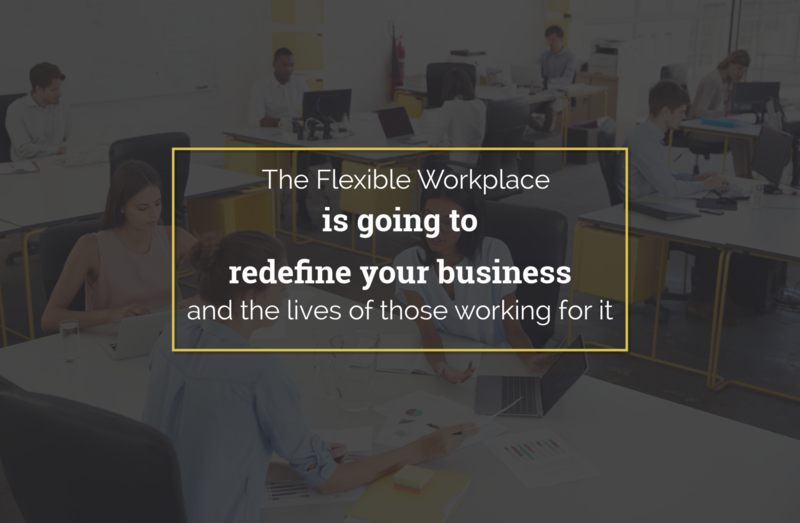 Working in a place that offers flexibility is key in today’s workforce.